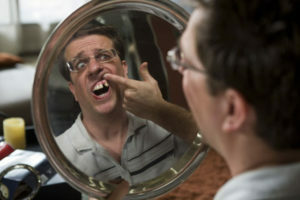 Tooth Replacement: A Nightmare Come True! Having a strange or sometimes vivid dream, is something most people experience from time to time. Although dreams often vary from person to person, one of the most common dreams (or nightmares) revolves around losing one’s teeth. Unfortunately for some people however, this nightmare has ended up coming true as they have sustained a severely chipped or damaged tooth, and are now in need of a tooth replacement. However despite this unfortunate and often untimely problem, there are several great tooth replacement options available, if you should find yourself in such a predicament. While obviously your teeth are very tough, did you know that your teeth are in fact harder than any bone in your entire body! To some this may come as a surprise. To others it makes a great deal of sense, as your teeth have the extremely important task of breaking down your food for consumption. Unfortunately even as tough as your teeth are, there are many factors such as hard foods, acidic substances, or simply neglect and old age, that can potentially damage or completely destroy your teeth. Therefore it is necessary to replace a tooth if damage or decay has begun to occur. Tooth replacement can be accomplished three different ways depending on the needs of the patient, each of which are capable of providing an effective long-term solution for the user. There are three primary options available when having one or more teeth replaced; each of these options is designed to accommodate different circumstances surrounding the patient’s overall replacement needs. Each of the three tooth replacement options presents certain advantages and disadvantages, which should be considered upon making one’s section. Often considered the most economical of the replacement options, the removable partial denture or RPD, is a removable row of porcelain dentures, as its name implies. A RPD can be used both as functional teeth and to serve aesthetic purposes. Despite the RPD’s relative popularity due to it being the least expensive of the options, it is the most accommodating for older individuals who may need several teeth replaced. However, it does present certain drawbacks. Over the years there have been quite a few instances of RPD’s getting lost or going missing, particularly among elderly patients or folks on vacation, thus leading some to seek a more secure solution. A bridge, or sometimes called fixed partial denture, is much like the removable partial. It’s a row of artificial porcelain teeth, fixated within the patient’s mouth. However the differences between an RPD and a bridge are not only the fact that the bridge is fixed (or non-removable) but also that the dental bridge provides greater comfort while chewing, requires less cleaning, and is as convincing as actual teeth. Although more expensive than the RPD, the bridge is in many ways superior overall, in addition to requiring little time to be created. The final and perhaps most sought after tooth replacement option is the dental implant. As opposed to the two previous options, the dental implant is more like an actual tooth that has been specifically created to replace your old one. This ceramic, custom-made tooth is strategically placed onto the jawbone of the patient, so that it may slowly be enveloped by the bone and gums over time becoming the permanent replacement for the missing tooth. Although dental implants are more expensive than the previously mentioned options, they require the least amount of maintenance and attention as the others, in addition to providing the authentic look and feel as a natural tooth. Although your teeth are tough and can last a very long time, if time has taken its toll and caused damage or decay, the three above-mentioned tooth replacement options are certainly available to replace your broken teeth, and end your nightmare once and for all. Dr. Charles R. Kimes, DDS and his expert team at Overland Park Dentistry look forward to having the opportunity to help you if you end up with a missing tooth! Or with any preventative, restorative or cosmetic needs you or your family may have. To schedule a dental appointment, contact us at our south Overland Park office at (913) 647-8700 or our north Overland Park office at (913) 341-2380.